Sabrina Sarabella is a fitness and nutrition expert who began the journey of building her online business from the ground up. To help bring exposure to her online business, she knew she needed to build a website. As a result, she began using Yola to create a fitness website. We decided to reach out to Sabrina to understand her site­-building experience with Yola and learn any tips she has for other online businesses. We were pleased to hear it’s been quite intuitive. The goal of Sabrina’s website is to communicate her experiences, share health­-related tips and ideas as well as recipes for her visitors. This is where the Text Widget comes in so handy. It allows Sabrina (and other Yola users) to easily add in any text content, highlighting key points with different headers. In addition, using the Picture Widget gives her the ability to add photos throughout her site. These photos not only provide visual interest to her site but also help to add authenticity to her business. We’ve found that high-quality photos help to round out online businesses that want to create a fitness website. Sabrina already had some great business branding to start, including her business logo and images. Sabrina had great colors in her business logo, so to keep the website consistent, we kept applied these colors to the rest of her homepage. With the help of Custom Panel Widgets, we helped her maintain a cohesive and attractive design. 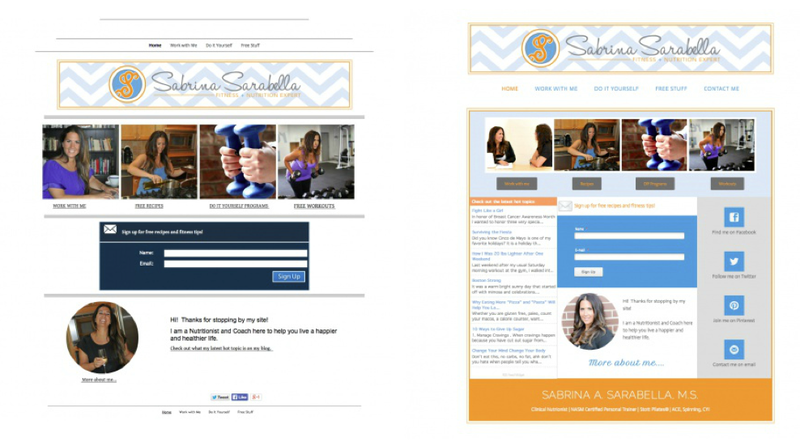 Since having her homepage redesigned by Yola, Sabrina has been getting such wonderful feedback from her clients. Are you ready to create a fitness website?